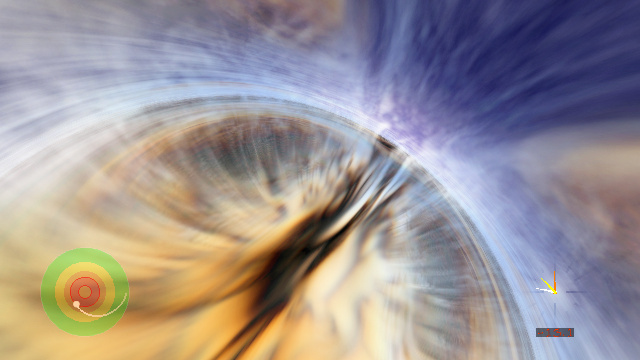 Journey into a realistic black hole. This journey into a black hole is a general relativistic volume-rendering with the BHFS of a general relativistic magnetohydrodynamic simulation of a disk and jet supercomputed by John Hawley at the University of Virginia. The movie is similar to one I did for the NOVA documentary “Monster of the Milky Way”, which premiered on PBS in 2006. The black hole is intended to model the 4 million solar mass supermassive black hole at the center of our Galaxy, the Milky Way. The clock shows your proper time, in seconds until vaporization by the inflationary instability at the inner horizon. The tidal force from the supermassive black hole is weak enough that you can survive all the way down to the inner horizon without being torn apart. 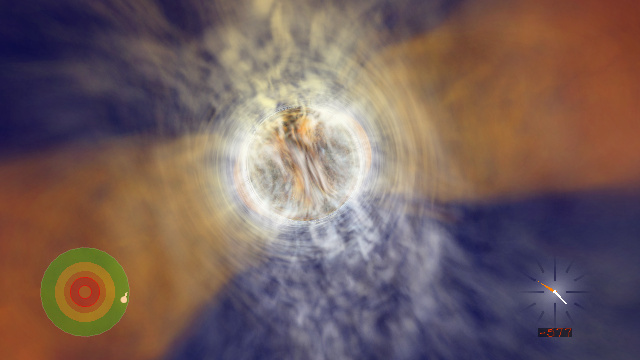 Journey into a realistic black hole. This one is in stereo. This is a stereo version of the same movie. The claim is that all the movies on this website are “scientifically accurate,” if general relativity is the correct theory of gravity. But of course it is impossible to make a movie that is scientifically accurate in all respects. The disk and jet are from a general relativistic magnetohydrodynamic supercomputer simulation. The ray-tracing and volume-rendering are general relativistic. You, the observer, fall on a real free-fall geodesic. The relativistic beaming effects from your motion are included. The coloring has scientific significance, in that the various parts of the disk and jet are colored with an appropriately red- or blue-shifted blackbody color. The reddish color of the jet is caused by the large special relativistic transverse Doppler shift. While meaningful, the coloring is not realistic. In reality the disk and jet would be hotter than any optical blackbody temperature, and they would not emit as a blackbody. The geometry is that of a charged (Reissner-Nordström) black hole (with charge-to-mass 0.9), not a rotating (Kerr) black hole. That is simply because I have not yet implemented rotating black holes in the BHFS. It is not a limitation of Hawley's simulation, which was done with a Kerr geometry. The excuse is that the interior structure of a non-rotating charged black hole resembles that of a rotating black hole in that both have an inner horizon where the mass inflation instability takes place. One day I hope to implement rotating black holes in the BHFS, but it will require a major investment of time and effort. Hawley stopped his simulation at the outer horizon of the black hole. His simulation was done in Boyer-Lindquist coordinates, so layers piled up at the outer horizon. To allow the visualization to continue inside the horizon, I took the piled-up layers and spread them inward inside the horizon. The movie uses only a single frame from Hawley's simulation. In effect, the black hole is in solid body rotation. Hawley provided me with a full set of 5000 frames, but near the horizon the time resolution is insufficient. 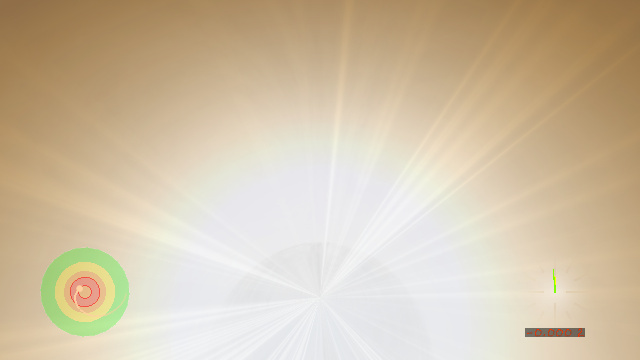 Interpolating between frames produced distracting visual artifacts. If you are surprised by the fact that the visualization still gives the impression of outflow, so was I. The movie does not take into account the different time delays from various parts of the scene. The absence of differential time delays is a side-effect of using a single frame of the simulation. Taking into account time delays would pose the challenge of using 4D instead of 3D textures for volume-rendering. The solid body rotation continues at a constant rate per frame near the inner horizon, even though the timing of the movie (per the clock) has been slowed down tremendously. I did this to give the (correct) impression of continuing motion. The quantity rendered is the radial Poynting flux (the radial flux of electromagnetic energy-momentum). This is not what a human observer would “actually” see, whatever that might be. 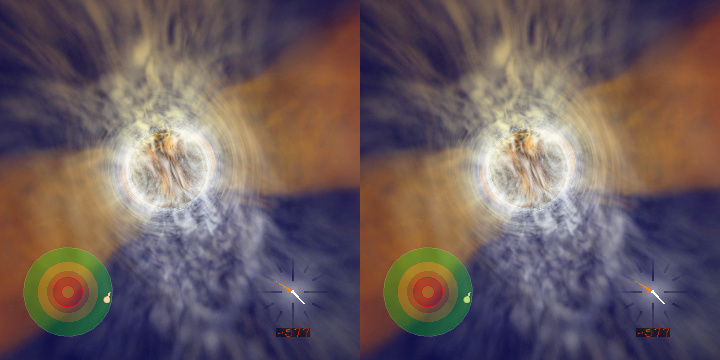 Hawley recommended (and I agree) the Poynting flux because (a) it shows nicely the fine scale structure in the disk caused by the turbulent magnetic field, and (b) it reveals the jet prominently. The geometry is Reissner-Nordström throughout. I did not attempt to take into account the modification of the geometry caused by the inflationary instability at the inner horizon. Actually this should be an excellent approximation for an astronomically realistic black hole, whose accretion rate is tiny. Nothing special happens as you pass through the outer horizon. 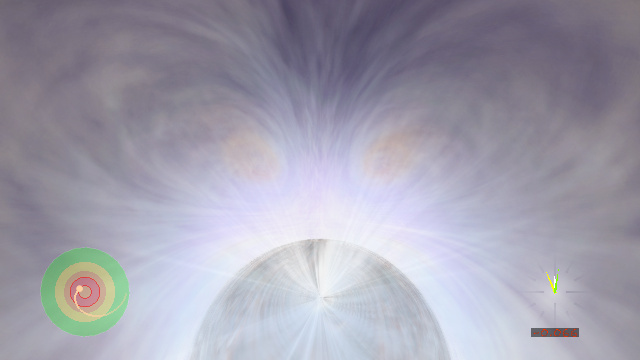 As you near the inner horizon, the outside Universe appears to grow brighter and more blueshifted. At the inner horizon you are vaporized by the mass inflation instability. The infinite blueshift at the inner horizon of the Reissner-Nordström geometry was first pointed out by Roger Penrose in 19681. Penrose suggested that the infinite blueshift would destabilize the Reissner-Nordström geometry. The full nonlinear character of the instability at the inner horizon was eventually clarified in a seminal paper by Eric Poisson & Werner Israel in 19902. The instability, which Poisson & Israel dubbed “mass inflation,” is caused by relativistic counter-streaming between ingoing (positive energy) and outgoing (negative energy) streams near the inner horizon3. Between the outer and inner horizons, the radial and time directions in a sense exchange roles. Whereas outside the horizon you are compelled to go forwards in time but you can go either inward or outward in radius, inside the horizon you are compelled to go inwards in radius but you can go either forward or backward in the time coordinate (the special time coordinate that expresses the time translation invariance of the black hole geometry). The inner horizon, where the inflow of space slows back down to the speed of light, is a place where the radial and time directions would like to revert to their usual roles. This produces an impasse, because ingoing (positive energy) particles want to fall into a place where coordinate time is going forwards, while outgoing (negative energy) particles want to fall into a place where coordinate time is going backwards. But time cannot go simultaneously forwards and backwards. Attempting to drop through the inner horizon, ingoing and outgoing particles attempt to exceed the speed of light relative to each other. As its Penrose diagram shows, in the Reissner-Nordström geometry ingoing and outgoing geodesics do in fact exceed the speed of light relative to each other, and cross two distinct inner horizons into two causally separated regions, the “Wormhole” and “Parallel Wormhole” regions. The Reissner-Nordström geometry assumes that the black hole is completely empty. But if the black hole contains even the tiniest amounts of ingoing and outgoing matter near the inner horizon, then it is impossible for the ingoing and outgoing streams to exceed the speed of light relative to each other. As the streams race through each other ever faster, eventually the pressure produced by the counter-streaming begins to produce a gravitational force that competes with the native gravity of the black hole. The gravitational force is inwards, to smaller radius, but the inward direction is in opposite directions for ingoing and outgoing streams. Thus the gravitational force produced by counter-streaming pressure acts so as to accelerate the streams even faster through each other. The result is an exponentially growing instability: the counter-streaming pressure produces a gravitational force that accelerates the streams faster, which increases the pressure, which increases the force, and so on. The inflationary instability acts like a particle accelerator of extraordinary ferocity. Whereas the streams of a terrestrial particle accelerator are accelerated by electromagnetism, the streams of the black hole particle accelerator are self-powered by the gravity produced by their own counter-streaming. The black hole particle accelerator easily reaches and exceeds energies comparable to those in the Big Bang. What does Nature do with such a machine? The above statements refer to a spherical charged black hole, but the same arguments probably apply to the more realistic case of a rotating black hole, whose Penrose diagram is quite similar. Unfortunately, the problem is difficult, and little research has been done on the inflationary instability inside a rotating black hole. Note added Oct 2011: I have been making some progress on the problem lately4,5.